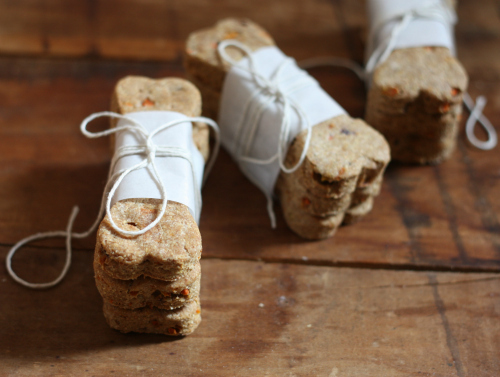 We decided it was high time to make another bulk batch of homemade natural dog treats for Basil. Our last batch of fresh apple treats ran out fairly quickly and we've been wanting to try something new. Not only can the recipe base we use allow for all sorts of natural ingredient combinations, it really helps us cut down on the amount we spend on natural treat varieties from the store (plus, we can't help but think they are a tiny bit healthier knowing exactly what goes into them). 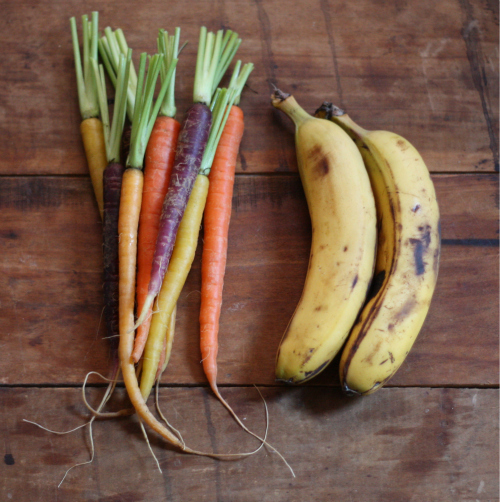 This go round, we opted for fresh carrots and bananas in place of the apples from our first batch and forwent the brown sugar since the bananas are naturally sweet. We tripled the following recipe since we like to stock up. This yields us roughly 40 large 4" treats, so if you use a smaller size cookie cutter you'll get more than enough. If you're looking for a bone-shaped cookie cutter, Etsy is a good place to find various sizes and personalized options, like these. 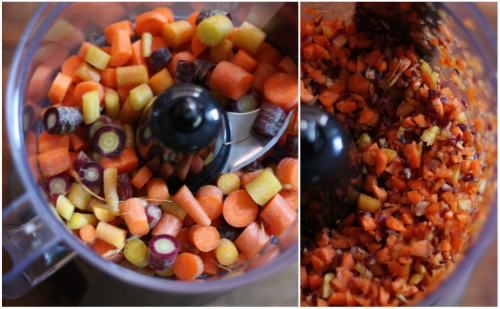 Note: With both the carrots and bananas, I chopped them into large pieces, then slowly pulsed them in our food processor. This not only saved me time, but created semi-regular sized carrot chunks and smooth banana mash to blend right into the rest of the base ingredients. I left the pulsed carrot pieces fairly chunky instead of pureeing them, because I like the idea of being able to see the actual carrot pieces throughout each treat. Flour your workspace and roll out dough to desired thickness. We went with about 1/2 inch thickness to allow for some expansion once baked. 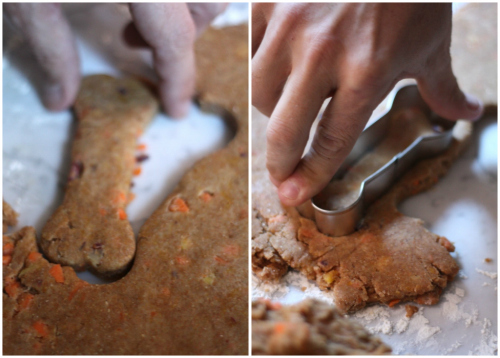 Cut cookies to desired shape and size — I used our 4 inch dog bone shape from a cookie cutter I bought off Etsy. Which one of these isn't like the other? See that little heart shaped cookie — I made that out of the leftover scraps of dough that wouldn't quite stretch into another bone shape. I'm saving it for Valentine's Day, shhhh. After baking, turn oven off and leave cookies inside for another 30-45 minutes until crisp. 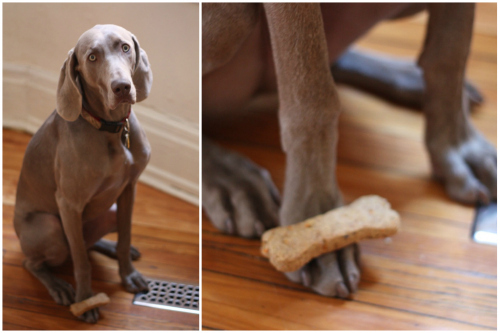 This step is important to make sure your treats harden up, otherwise they will remain like soft cookies. 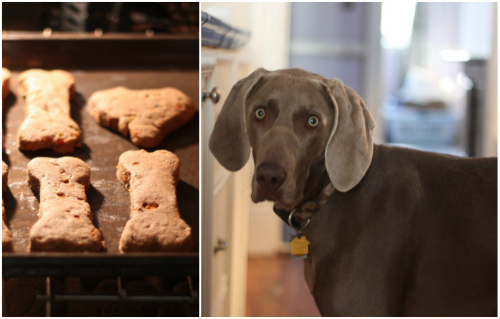 Once crisp, remove dog cookies from oven and let cool. Transfer to zipper bags or airtight containers and freeze to preserve freshness for your little one! And again, not being quite as patient — but hey, can you blame him? 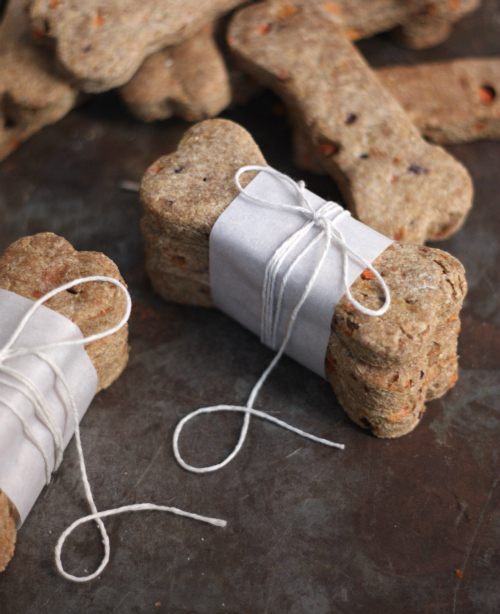 We're looking forward to trying out new variations on this go-to dog treat recipe and hope you'll let us know what's working for you if you try it out too! Loved your applesauce treats, can't wait to try these too! Thanks Michelle - let us know how Dillan likes them! I love his little face! My pups enjoy bananas and carrots too. He is full of personality and is such a heart-breaker when he wants to be. Awesome Jasanna - can't wait to hear how it goes. Those carrots are beautiful...I have to admit I have never seen any like that. Are they an heirloom variety? I would love to plant some in our garden...where did you get them? Yeah, have to have some! Will check out cubits now!!! 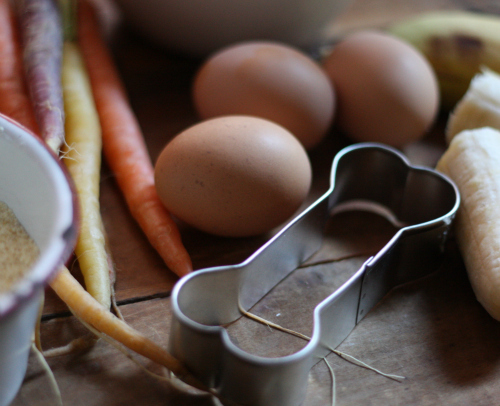 Thanks for the shout out guys :) We'll be turning some accidentally over-wintered carrots into dog treats just as soon as the ground thaws enough to dig them out. Do you keep them in the freezer all the time and just pull one out to give to your furry baby? Hey Natasha! Right now, we like to keep them in the freezer and give them to him right out of the bag. For some reason, Basil it totally fine with frozen things and likes them - plus it takes him a little longer to work through them. I think these would keep in food safe storage for a couple weeks without being frozen though! I stumbled across your blog while looking for natural treats for my 3 Golden Retrievers, Mackenzie, Maesie and Matilda. I was prepared to make Apple Treats this morning, now I find I will also be making the Banana and Carrot treats plus the Sweet Potato Chews. I'm sure my 3 M's will enjoy these treats as much as Basil does. Judet, SO glad these might work out for you! Big puppy kisses to your 3 M's from us and Basil! This is for Basil: Thanks so much for sharing your favorite natural treat recipes. Mac, Maesie and Matilda from South Australia. Could you please let me can this be done without Cornmeal and How long I could store this treat for my pets? We do not see any reason why you cannot use corn meal. As far as how long they keep we put them in a freezer bag and store them in the freezer. When we need one we just pull it out and he loves them cold also! Good luck with your batch! Corn is not easily digested by dogs and often causes dry skin. I would try substituting rye flour or cracked wheat for the cornmeal. Carrots are fine. In fact they are recommended for most animals. Do you know who much sugar is in 8 average sized carrots? 4g !! Carrots are very good for cleaning teeth in fact. Didn't your mother tell you this? So offer your dog a whole carrot! Your right, it's not the same as cane sugar! They may also help prevent cancer, promote healthy skin, prevents heart disease, helps prevent heart disease and other benefits. these treats look great! Can you tell me how you wrapped them? I ge the string part, but what is the paper you used? Hi there we simply used parchment paper cut to size! Enjoy! These were a big hit with my dogs! Thanks for sharing the recipe! Just found your blog and I am very anxious to try this and some other recipes. I am wondering you would have a suggestion for me though. I am not much a baker but due to some pretty bad allergies, I have recently started making my own treats. They have been a success so far but I have keep wheat, corn and soy out of the mix. I use Brown Rice Flour but would you have an suggestion on what I might be able to substitute the cornmeal for? Great question — we've heard substituting rolled oats might be a good way to do it! Let us know how they turn out. Thanks for mentioning wheat, corn, and soy products. Because these three cause the most allergy problems in dogs, the better-to-best dog foods offer at least one variety without these grains. 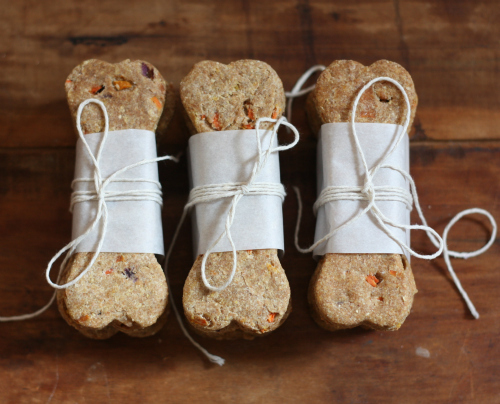 Oatmeal and brown rice flours should make nice substitutions in your dog treats, and I'm going to try them on my five little guys. I just found this recipe! Have you tried substituting the vegetable oil with sugar-free applesauce? We haven't, but love the idea, thanks so much for the tip! Coconut nut oil is far better for them than vegetable oil. Would they still work as chewy treats if you chose not to leave them in the oven for the extra time? Or do you think that they might not cook as thoroughly? Not that my little guy would complain one way or another, he practically takes fingers off when I just give him a carrot! Thanks! Really excited to make these! I think they could still work as chewy treats, yes! This may be my answer for doggie gifts this Christmas! I may try using ground rolled oats instead of whole wheat flour, since I have all of the other ingredients. Any idea how many cups or weight of carrots you used? Thanks! p.s....when you say you tripled it and then "this yields 40 x 4" treats"--do you mean tripling it does, or the regular recipe? Thanks so much! just made a batch, added 1/2 cup of peanut butter...my dogs LOVE them. they were really sticky so i added white flour while i was rolling it out to 1/2 inch thickness, i just folded it in(and made sure i had my hands and counter covered in flour). im giving them for christmas to all of our doggie friends. mine yielded 30 large (3 inch) treats and 26 small (1.5 inch) treats. thank you for the awesome and super easy recipe. Jodi you are quite welcome and glad you enjoyed them! Happy New Year! How fun! Mystique and Stella would love them. Can you use overripe bananas, and how much is the quantity of chopped/grated carrot? 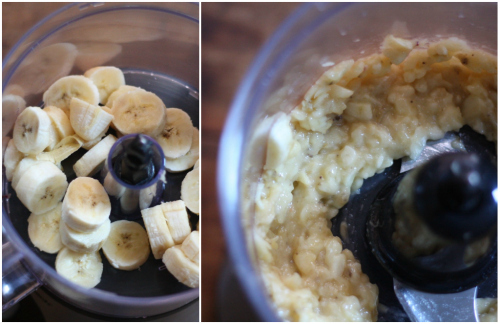 I think overripe bananas would do really well in this recipe — great way to use them up! 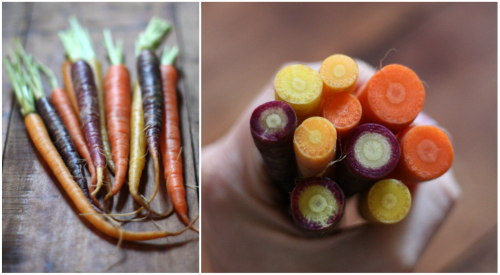 No measurement on the carrots — just use what you've got on hand as much or as little as you like! Was very excited to make these treats, but the dough consistency was a gooey mess. Did you chill the dough? Maybe that would help?! Disappointed. Oh! 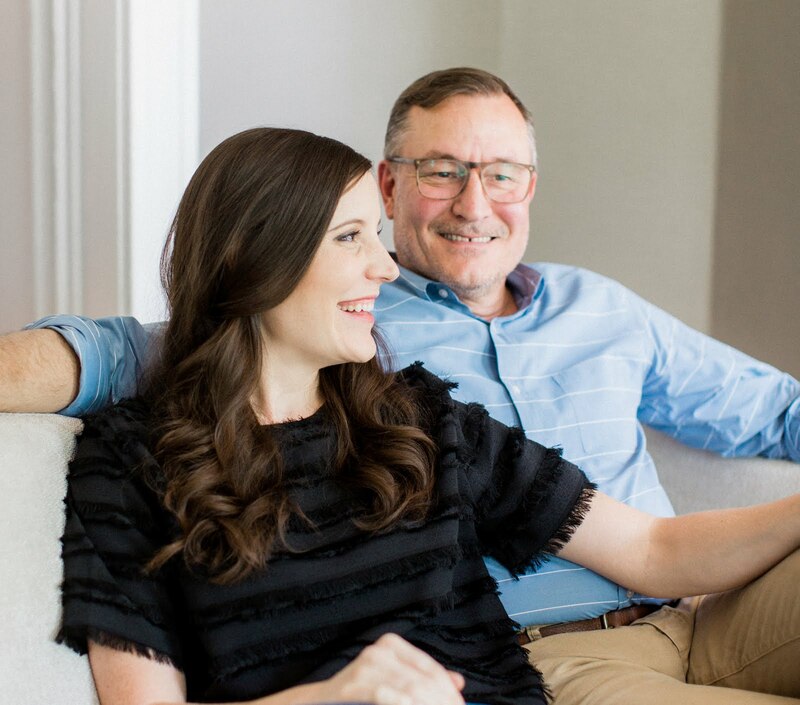 So sorry to hear it! Chilling might be a good option, great point. Also, adding more dry ingredients like the flour or cornmeal might help with a gooey consistency as well. I did try adding more flour and chilling which didn't help, unfortunately. However, our pooch loved the end product and didn't seem to mind how they looked! Maybe I puréed the bananas too much? Thanks for the recipe ideas! Aww well thanks for trying and sometimes we have to do things a couple of times to get them right! I also found the dough came out really sticky, even after adding more flour. However, I just made them into "cookies" instead of rolling out the dough for the bone shape. Definitely didn't hear any complaints, he LOVED them! Also tried the apple treats, huge hit! It's only been the second day and every time I come into the kitchen he runs to the freezer! Thanks for the great recipes! We just rescued a little poodle in November from a very abusive situation and our 4 girls have had so much fun showering love on our newest family member. The girls were thrilled that the dog LOVED them. In fact they enjoyed making them so much that they are already talking about making more for some neighbor dogs as an Easter present. Thanks so much for the tutorial! 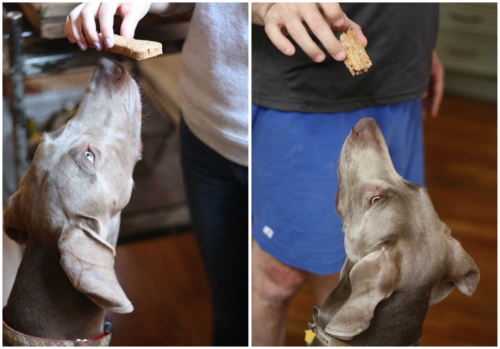 Oh what an amazing story — so glad to hear your new poodle is getting lots of love and enjoying the treats! Basil sends his regards your way! Any shape will work — so glad to hear you might try them! It is better to soak whole grain / nuts / seeds for up to 8 hours in acid-based medium (i.e. whey / lemon water) before using. This breaks the enzyme inhibitor in them and makes them more digestable. Wow - these were the messy most difficult cookies to bake! So sticky all over the counter the rolling pin and my hands. Really needs LOTS more flour than the recipe calls for. I have made lots of dog biscuits but never encountered such a mess. I'm amazed that yours turned out in 'any' shape at all. Just made these and my girls LOVE them. I did use brown rice flour in place of wheat (allergy) and I used oatmeal instead of corn meal (didn't have)...I didn't feel like chopping carrots, so I had a jar of carrot baby food and used that (LOL)and instead of brown sugar I used molasses. The dough was a little sticky (because of the baby food I'm sure) but I kept adding flour and oatmeal until it was the right feel. Rolled it out and used a pizza cutter to cut small squares (I have little dogs). The dough was so easy to work with (my favorite receipe by far, and the girls agree). I've been using nearly all of the same ingredients but adding peanut butter, sometimes pumpkin and raw oats...oh, and never wheat flour, either rice or oat. 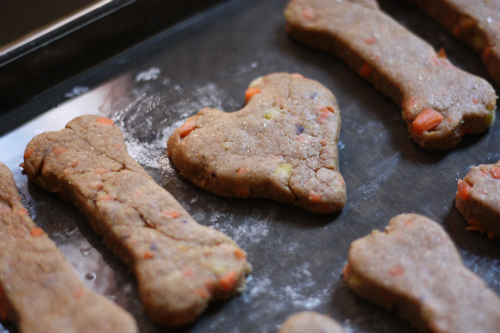 There's actually quite a lot of wiggle-room with doggie cookies, you can add just about anything and since they're baked for such a long time for canine-hardness, you don't have to worry about them being done 'just so'. Love you blog design, btw! 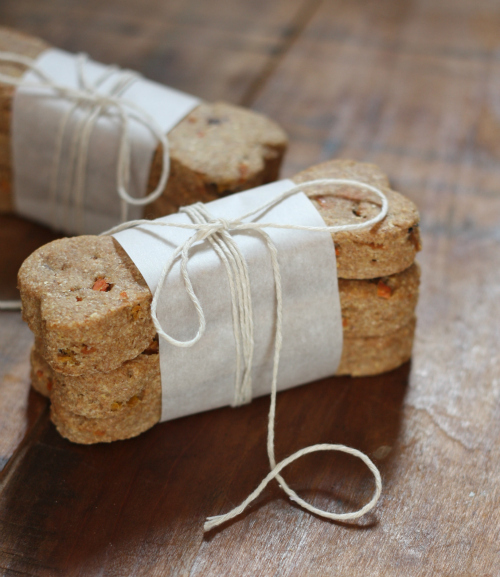 TurboPUP has taken the nation by storm with its line of complete meal bars specifically designed to make it easy to take your dog with you anywhere. 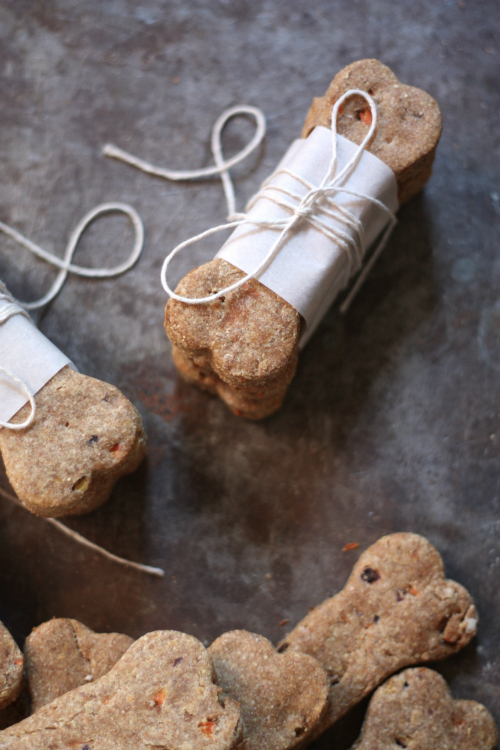 I had been dying to make these since carrots & bananas are my pups 2 favorite treats. I was a little disappointed when I got to the step "roll out dough" and mine was still so sticky and gooey, I thought maybe I used the wrong amount of flour or something. Recipe didn't state how many carrots to use but I saw 10 in your picture so I used 7 since a few of mine were bigger. Maybe mine were all too big. That and I put the bananas and carrots in the food processor together so some of the carrot was almost as mashed as the banana. I was going to have to add a ton of flour to make these rollable so I just mashed it down as best I could and cooked because I knew he wouldn't care. These things are like crack for him! He is obsessed so regardless, I will be making over and over! We are so glad they turned out! Whew! Sometimes we do have to adjust the flour content so it really is hit or miss sometimes. Especially after you mix in the fruit! Yay! Thanks for letting us know and Basil says woof! love this recipe. We also make homemade biscuits for the same reason and never include any oil or added sugar so this is perfect! Thanks for sharing! I have 2 Weimaraners! I can't wait to make some for my boys! This looks awesome and I want to make these for my dog, but would you have a recommendation for something to replace the bananas? I am allergic to them and wouldn't be able work withe them. Hi Anna, so excited you want to try this. Any soft ripe fruit would work and we were thinking mangos might be a nice tropical spin! Good luck and we hope you enjoy! I recommend doing a search on what not to feed dogs. Some fruits and foods can be deadly for them for instance; grapes, avocado, apple seeds, etc. these will cause kidney problems and other. I love my 3 little dogs and don't want any to suffer. Try it with rice flour and let us know if that works and we can update the post with that as an alternative. Luckily Basil is not allergic to wheat. 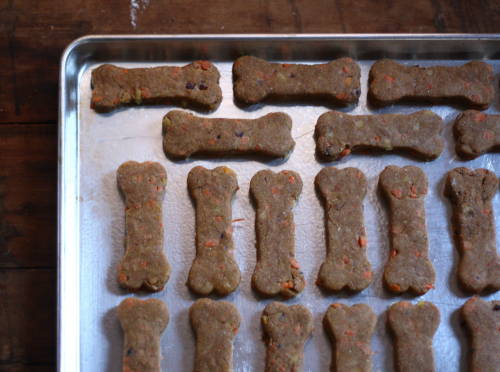 I have a small biz, making homemade dog treats and I can't wait to try this recipe. My Chiweenie...Harley Sue, loves carrots but a banana fan. I'm going to sneak the banana's in and maybe she won't notice. Lol Love finding new recipes and I look forward to trying more. Harley sends her love to Basil and what a handsome boy he is! also good is adding some garlic powder and fresh garden herbs (thyme, mint, parsley) to the mix. Garlic is poisonous to dogs! Who told you that? Garlic is not poison our for dogs. I have been researching raw diet (and commercial pet food), for 6 years now and I can tell you that garlic is not toxic. However, onions are. A not from my advocate vet of 25 years. It is always best to be conservative with garlic, even though i have seen very high doses used safely. raw garlic can be a topical irritant to the stomach lining, which is why dried garlic is safer. Dogs can handle higher doses than cats, but sensitivity to garlic appears to be variable, so I stick to really low safe doses, less than 1% of the diet ( i use 0.25%). I have never seen or diagnosed garlic toxicity in any pet, but there a couple (and I mean only a couple) of reported cases in veterinary literature. Most of the confusion comes from the similarity to onions, which are clearly recognised as toxic. Charcoal is a no no in any form, unless you use it in an acute poisoning situation. Burnt food as charcoal is the most dangerous form, but I prefer to play it safe and avoid all forms. there are better ways to correct flatulence (eg probiotics). I have a large dog who has a very sensitive gut and has many food allergies, corn being at the top of the list. What would happen if I did not add the cornmeal? Coconut flour can replace any and/or all of the flours or corn meal. Using coconut oil instead of any other oil will help further. 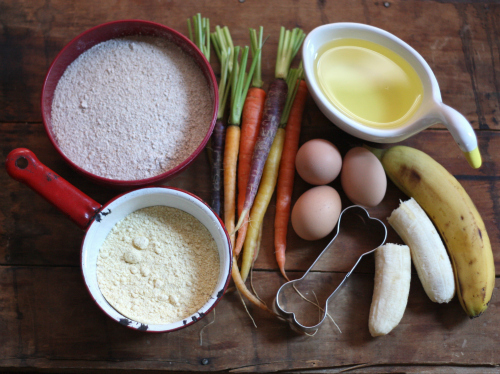 I am looking forward to make something including the carrots and bananas. There are two large dogs in the house both are at least about 90 pounds each. If I wait too long to give them the homemade peanut butter cookies, they will come and beg for them. With all the coconut oil and flour in them the coat is in better condition and the old man dog is smelling better. Making these today for our little guy and gal. Using a pumpkin cookie cutter for Halloween! One will eat anything but the other is a little picky, but I bet he will eat them if he sees her eating them. Really this is a delicious food for dog. A nutritious, balanced diet is essential to keeping your dog healthy. Thank you for sharing this information. I wonder if I can substitute the oil for applesauce like I do with people recipes... Or if they are better off with oil such as EVOO...what do you think? How long do these last without freezing? Thinking of using them as decorations on the xmas tree..... time to challenge my training for the dogs! hi, I've substituted the cornmeal with oatmeal but after combining the flour, oatmeal, carrots and banana together my dough is already too sticky even before adding the oil and water .. I'm not sure what went wrong??? pls help! Indy, my mini poodle puppy, adores your carrot and banana treats. We subbed coconut oil for cooking oil (it helps his tear stains) and oats for cornmeal since I didn't have any cornmeal on hand. They made his Christmas Eve- thanks for the great recipe! Love the treats. My Layla will sure love these. Just finished making these for my two Saint Bernards...they're crisping up in the oven now! The dough came out perfectly and was easy to work with for me. I wonder if seasonal/temperature/humidity differences might be the cause of some other people's issues. Next time I might try oats instead of cornmeal and applesauce instead of vegetable oil. I'll let you know how it goes! We have read wheat and corn are not good for dogs. We will make a batch using ground steel cut oats and rice flour instead of wheat flour and corn meal. Dogs do not need sugar or any sweetener at all and garlic is a definite NO NO! - it can be toxic for pets! We will try with pureed apple instead of veggie oil. You are right, dogs do not need sugar. Garlic, on the other hand is not a NO NO, it is a YES YES, has nutritional value for pets and is beneficial, so whoever told you that, needs to look up veterinary literature or research deeper. A friend of mine who has been a vet for 25 years an advocate of natural raw diet for pets will tell you that garlic is safe for pets. It is always best to be conservative with garlic, even though i have seen very high doses used safely. raw garlic can be a topical irritant to the stomach lining, which is why dried garlic is safer. Dogs can handle higher doses than cats, but sensitivity to garlic appears to be variable, so I stick to really low safe doses, less than 1% of the diet ( i use 0.25%). I have never seen or diagnosed garlic toxicity in any pet, but there a couple (and I mean only a couple) of reported cases in veterinary literature. Most of the confusion comes from the similarity to onions, which are clearly recognised as toxic. Charcoal is a no no in any form, unless you use it in an acute poisoning situation. Burnt food as charcoal is the most dangerous form, but I prefer to play it safe and avoid all forms. there are better ways to correct flatulence (eg probiotics). Would like to try these. Any reason why you don't use coconut oil? can i use cornflour instead of cornmeal? That's a good question TCaemichael, I'm in rural Australia & I have looked for some cornflour without success! Hello I have a dog that is allergic to chicken so rather than putting in the egg would you just add more oil? Chia seeds are a great substitute for eggs. Take 1 tablespoon of black chia seeds and soak in 2 tablespoons of filtered water mixing for the first 3-4 minutes and then very minute. After 5-6 minutes, once the seeds have expanded, ready to use. A tad late to this party but I recently stumbled onto your awesome website. 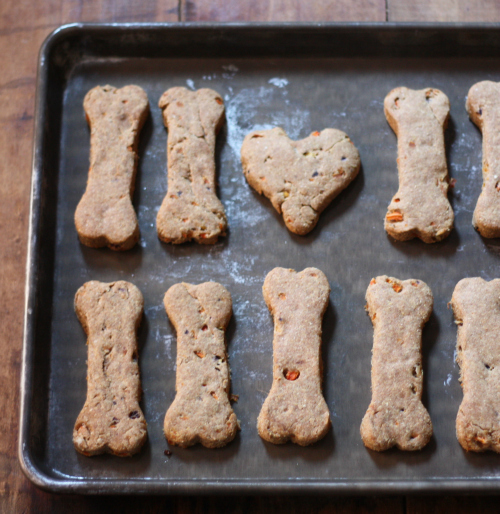 Made these for my senior Great Dane and he LOVES them :) Can't wait to try your apple treats soon. Thanks a bunch!! Since this just came up again, I will comment. Just be aware of what your pet is allergic to, my English Bulldog is highly allergic to bananas. So for me I will make them, minus banana and will substitute apples/applesauce. I love making treat for my crazy furbabies! Thanks for more choices! I'm gonna try this!!! I have a question... they need to be keep in the firdge? how long can you keep them?? I was so excited to make these and I got everything going and mixed wet with dry and my dough is not dough..it's a batter...I added more flour...not helping...what did I do wrong? Wow, we are not really sure. If you used the proper amount of dry and wet ingredients and with some mixing you certainly should have gotten a doughy textured ball. We have made these many times with much success. Anyone else have this issue? a measurement for the carrots would be helpful as the size of carrots and bunches of carrots vary so much. Can you use coconut oil in place of vegetable oil ? 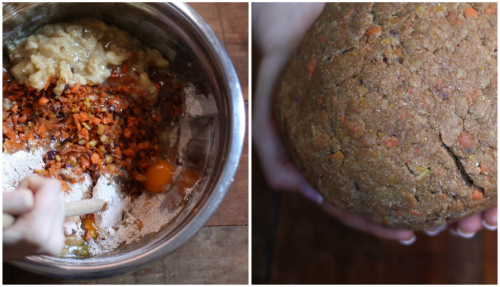 Thank you for posting this dog recipe treat and the sweet potatoes too! I don't really like cooking and not much of an oven user either but I will try the recipes for my Yorkies. The treats seem good even for people!! Thank you all too, for the comments that help and the substitutes, they all add to my inexperience. How timely that I saw your recipe in my Facebook Timeline as I have 4 apple trees that at the earliest, this year can bear fruits. 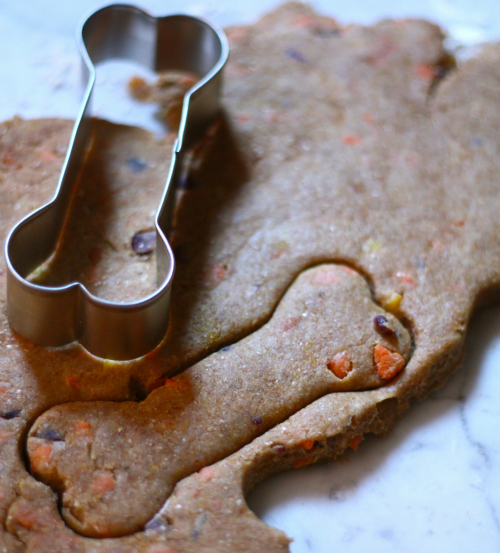 I already have the bone cookie cutters (large and small) and I am sure my neighbor dogs would also appreciate the treat!